The coast of Brazil provides a wonderful alternative for Transatlantic cruisers. The culture, people, food, flora, fauna and scenery are unique, as is the experience of sailing one’s own yacht into Rio harbour. Mina2 crossed the Atlantic in December 2009 from Cape Verde to Salvador. My blog gives a flavour for the crossing and our cruise south down the Brazilian coast: http://blog.mailasail.com/mina2 . It has been described as “rather self-indulgent and only loosely based on the truth” which is an accurate summary, so take some of it with a pinch of Atlantic salt. From Salvador southwards there are two big cruising grounds: Baía de Todos os Santos with the city of Salvador at its entrance, and Baía da Ilha Grande (pronounced “Eelya Granjee”), in between Rio de Janeiro and Sao Paulo. The latter allegedly has 365 islands – one for each day of the year – together with the town of Angra Dos Reis and the beautiful old colonial town of Paraty (pronounced “Parachee“). Both cruising grounds offer very protected waters with numerous anchorages that could be explored for weeks. Apart from in the bigger towns where you find the occasional local sailing boat, you pretty much have the entire coast and its anchorages to yourself. Unless otherwise stated, the latitudes and longitudes are the positions in which we anchored / moored. I have given precise coordinates so, if you wish, you can drop anchor in a place that has been tried and tested without the need to swan around recce’ing the best spot. That doesn’t mean to say there aren’t better places! Balette page references refer to his “Brazil Cruising Guide” – see below. Brazil Cruising Guide by Michel Balette. Originally only available in French, this is now (June 2010) published in English by Imray. ISBN 978 184623 201 5. By far the best guide currently available for Brazil. Sadly, it had not been published at the time of our cruise. Usual IMRAY format with loads of information and data about the country as a whole, then detailed data on individual ports, havens and anchorages with loads of photos, chartlets, waypoint routes etc. Invaluable. Given that most cruisers will be coming from or going to Argentina and Uruguay it’s a shame that the scope of the book doesn’t extend beyond Brazil, but let’s be grateful for what we have. There are occasional errors with the waypoint coordinates, so do check that they make sense before relying on them. Havens & Anchorages of the South Atlantic (A Companion to South Atlantic Circuit). Tom Morgan. Published by RCCPF. ISBN: 0954190041. Good but now rather dated. But usefully covers Uruguay and Argentina as well as Brazil. Cruising the Coast of Brasil by Marçal Ceccon. ISBN 8590123715 . Available in Portuguese and English, this was the bible until Balette published. Apparently there are also local guides available, in Portuguese. Do not rely on C-Map cartography for cruising down the coast. Many of the havens and anchorages you would wish to or have to enter are only covered on a scale of 1:300,000 rendering them useless for coastal pilotage. Checking with C-Map (August 2010) there was little likelihood of their filling the gaps in the foreseeable future. In addition to paper charts, the Brazilian Hydrographic Office makes many excellent charts available for download on the internet on: http://www.mar.mil.br/dhn/chm/cartas/download/cartasbsb/cartas_eletronicas_Internet.htm . These will require a chart reader to view them on a computer, but the hydrographic office site above suggests a number, some of which are free. I used Seaclear, and this is available for free download on www.sping.com . The yachting bureaucracy in Brazil is certainly no easier than it is anywhere else, and the penalties for inadvertently tripping up are, I’m told, severe. So it’s best to get it right. Few of the officials speak English, which doesn’t help unless you have workable Portuguese (or, at a push, Spanish). In many places, all the required offices are located at opposite ends of the town (and the Polícia Féderal (Immigration) is sometimes located only at the airport which may be miles out of town), so it’s best to allocate the best part of a day for all the formalities. Polícia Féderal (Immigration). All crew will need to attend with their passports, respectfully dressed (long trousers and shirts). The skipper will also need all the ship’s papers. Your passport will be stamped with a 90-day visa. For visits of longer than 90-days, the visa can (and must) be extended for a further 90-days. (Do this well in advance of the expiry of the first 90 days). The other offices only the skipper need attend, but taking all the crews passports. Receita Féderal (Customs). They are not only interested in any contraband which you might be bringing in, but they are also interested in your yacht. Every foreign yacht whilst in Brazil must formally be the responsibility of someone. If you are staying with the yacht, that someone is you, and they will issue you with a certificate stating that you are responsible for the yacht for 90 days (to tie in with your passport visa). So if you are extending your stay beyond 90 days then you need to have this certificate endorsed or exchanged having had your visa extended. If you leave the boat in the country for a while, whilst you leave the country, you have to arrange for someone else to be approved by the Receita Féderal as being responsible for the boat. In practice, this has to be a public marina that is known to the authorities, so it is not possible to leave the boat in the condominium mooring of a friend for instance (as we discovered). So before you leave you have to get a form for the marina to fill in accepting responsibility and have this (and other documents) stamped by the Receita Féderal and the Policia Féderal. On your return, once again visit both offices to reassume responsibility. The boat can stay in Brazil under these arrangements for a maximum of two years. Ministério da Saude (Health Department). Here you fill in another form, present your vaccination certificates and get another official document (the certificado de livre prática). Finally, the Capitania dos Portos who will stamp your official entry document. So at last you and your yacht are officially in the country which you can now start to enjoy. BUT… every time you leave one state and sail into another, you have to get both the Policia Féderal and the Capitania dos Portos to sign you and the yacht out of the state by issuing you with a passe de saída at your last port. You then have to get their counterparts to sign you in at your first port of call in the new state. Having been issued with your passe de saída you have 48-hours to leave the state, so you can visit a couple of anchorages on your way out without problem. The regulations are not often used (not many tourist yachts) and the knowledge of the officials varies. Some believe that you need to check into every port you visit and not just when crossing state borders. So when arriving in a new state, declare your next port of call as the port from where you will be getting the passe de saída to exit the state. Should you be asked in between, you have either been in anchorages with no offices, or you have had to divert into another port because of weather / problems with the boat or whatever. When you and the yacht finally leave the country, you will have to visit all of the offices with the exception of the Health Department. Make sure that the Policia Féderal puts an exit stamp on all your passports. Iridium. I now use Iridium for email, forecasts and grib files. It is a great deal easier, quicker and more reliable in my opinion than SSB radio. It can also be used, of course, as a telephone. You can use it anywhere in the world (one of my crew proposed marriage to his girlfriend in Hartlepool when we were 600 miles from land whilst crossing the equator! ), and with a 12-month 500 minute package it works out at US$ 1.72 per minute which can be cheaper than roaming charges on a mobile. To send and receive a handful of short emails and to receive a forecast and a grib file normally takes less than 1 1/2 minutes of airtime. I use a handheld unit, the Iridium 9555 permanently plumbed into a fixed external antenna, but which can be removed and used from a liferaft in an emergency (the telephone number of MRCC Falmouth is the first number on my speed dial). I highly recommend MailASail (www.mailasail.com) for all your Iridium needs: hardware, software and Iridium airtime packages. Their ExpressMail compression software minimises airtime and thrown in to the package is their excellent blog service complete with a Google Earth-type track and position map (my blog, for example, is at http://blog.mailasail.com/mina2). Ed Wildgoose who runs MailASail provides an after-sales service that is second to none. He will make you feel like an incompetent twit, but he seems to respond to emailed problems within minutes at any time of the day or night and always with a simple fix. SSB. Whilst cruising the Brazilian coast, my SSB was not working, so I can’t comment on any nets etc. WiFi. WiFi signals are accessible from many marinas and even anchorages. I’ve found that having a signal amplifier (available from MailASail amongst other places) considerably increases the chances of a workable signal. in the UK set up a Skype account and either buy some credit (automatically topped up) or subscribe to a pay monthly package. get an unlocked dongle (about £35 on the internet). buy a local PAYG data SIM (in Brazil called a chip, pronounced “sheepee”). Temperature. In the southern summer it is hot. Very hot. And humid. Although supposedly the dry season, rarely a day went by without one or more short, very sharp showers. They arrive without warning, so for even a short excursion ashore the boat has to be battened down with all the hatches shut. Nights in harbours and anchorages were constantly interrupted by having to take down the essential wind scoops and close all the hatches for a shower, during which time the already high temperature below decks becomes intolerable. I’m slightly ashamed to admit that I’m seriously investigating air conditioning: if not one plumbed in, then at least a portable unit for use when attached to mains power in marinas. Wind. As a general rule of thumb, the predominant wind down the Brazilian coast is moderate and northeasterly during the summer months, and southerly in the winter months. But even in the summer, depressions can sweep up from Argentina with strong winds and high seas. As some of the stretches between havens can be as far as 400 miles (eg Pinheira to Rio Grande) you need to keep a particular eye on the forecasts. (Read the horrifying account of the storm in these waters in Adlard Coles “Heavy Weather Sailing”!). In the summer, when a front is coming through, the waves kick up before the wind. In the winter, vice versa. (This is because the waves kicked up by the cold front travel faster than the speed of the cold front. In the winter, the cold fronts travel faster). www.dhn.mar.mil.br which is the site of the Brazilian Hydrographic Office and has an English transalation. Balette suggests one or two others as well. When offshore and onshore, I pick up forecasts and grib files by emailing Saildocs (www.Saildocs.com) and display the grib files on Ugrib software, downloadable free from http://www.grib.us . As Michel Balette has done all the hard work, rather than reiterating loads of information I will assume that you have a copy of his Brazil Cruising Guide and these notes will supplement his work. Passage to Salvador from the north. If you are coming from, say, Cape Verde, in December, the favoured strategy is to head due south or slightly east of south until you cross the ITCZ at roughly 25°W before heading for Brazil, getting a good angle from the SE Trades, and leaving Maceio a good 100 to 150 miles to starboard rather than hugging the coast, as the wind dies within 50 to 100 miles of the coast. Approach to Salvador. Immediately to the south of the Santo Antônio lighthouse on the eastern side of the entrance to the bay there is a shallow bank extending about 4 miles offshore. Balette (p36) implies that this should be left offshore to starboard before heading in but, unless there is a strong southerly when the seas break on the bank, the inside channel in between the shore and the north cardinal buoy is fine, albeit with strong tides running through it. That way you also get a spectacular view of the city on your way in. In Salvador there are two marinas: the first is Bahia Marina (Balette p38) and further on there is Terminal Náutico de Bahia. I stayed in the latter (12°58.319S 038°30.943W), but if you need a lift out, Bahia Marina is the only one with a (40T) travel hoist. Bahia Marina is alleged to be rather more expensive and is certainly less convenient for visiting the town. If going to Terminal Náutico de Bahia, the closer your berth is to the marina building the better chance you have of being able to access their WiFi from your boat. Few, if any, of the marinas in Brazil compare in terms of quality and services with those in Europe. But if you have any need for repairs or services, the yachtsman’s Mr Fixit in Salvador is Marcelo. He will do (or arrange to do) anything from rigging and sail repairs to anything mechanical or electrical. If he hasn’t found you first, just ask at the marina office. Marcelo speaks excellent English. The Terminal Náutico de Bahia has water (which we didn’t trust for drinking) and both 110V and 220V mains electricity. But both water and electricity supplies are unreliable: the water supply kept on drying up (so no one could flush the marina loos) and there was a surge in the electricity supply which fried all the electronics on the boat of a friend, effectively delaying his cruise for months. So far as leaving the boat for a long period of time is concerned, I did hear that during a period of heavy wind and rain, the surge coming into the Terminal Náutico was so great that stout mooring lines were snapping like elastic bands. A friend had his boat well off the pontoon (all boats are bows or stern to) with chains through car tyres as dampeners. In these conditions the tyres were simply sawn through. Whether the conditions in the Bahia Marina were better or worse, I don’t know. But in normal conditions the Terminal Náutico is well placed. It is close (relatively) to all the various offices one has to visit to clear in and clear out (see under “Brazilian Bureaucracy, above) and it is very close to the tourist area. The marina is in the docks area but close (5 minutes walk) to the the Elevador – the lift that takes one up to Pelourinho – the historic old town at the top of the hill. Security is not a problem in the marina – it is kept locked at all times with armed guards by the gates 24/7. But the moment you leave marina the protection stops. The area between and immediately around the marina and the Elevador, which includes the interesting if touristy Mercado Modelo – a big building that used to be the slave market – is safe enough during the day, and once in the old town one is safe enough in the evenings. But don’t even think of walking back to the marina at night – take a taxi from Pelourinho. At any time it would be best not to strut around with the Gucci watch and the expensive camera on display. It all sounds rather terrifying, but if one is sensible it is generally perfectly safe. In the evenings Pelourinho is the place to go – fascinating, lively and full of Brazilian music and good Bahian restaurants. Closer to the boat, there is a bar and restaurant in the marina building and also restaurants three minutes walk away in the Mercado Modelo. Baía de Todos os Santos. I didn’t have as much time to explore the Bahia as I would have liked, but probably the first stop would be the island of Itaparica opposite Salvador. The anchorage for the main town is on the western side of the northern tip of the island (Balette p55 – 12°53.20S 038°41.235W) and there is also a marina there which I believe some people use to leave their yachts for extended periods. Itaparica is altogether more laid back and safe than Salvador. Further down the Itaparica Channel one can anchor in 5m off a palm tree-fringed beach by the quiet little village of Mutá (12°59.505S 038°46.362W). On one occasion there was an uncomfortable chop so we tucked ourselves round the back of the adjacent Ilha da Matarandiba (13°01.291S 038°45.121W). Technically we were just inside a no anchoring area on the chart but there were four other local boats anchored there. If Salvador is your initial landfall in Brazil you will see for the first time the subsistence fishing way of life of much of the coastal community. Typically one or two men in an ancient dug out canoe being paddled up the rivers either deploying a much-repaired net or jigging a fishing line to feed their families. Some have a small sail – their “auxiliary” – that helps to waft them to and fro. The larger boats, saveiros, sport altogether more magnificent sailing rigs. The other “must ” whilst in the Bahia is to spend a few days up the Rio Paraguaçu. First stop would be Maragogipe (Balette p72) which is up the spur opposite and to the west of Ilha do Francés. Anchor near the town jetty (12° 47.099S 038° 54.40W). 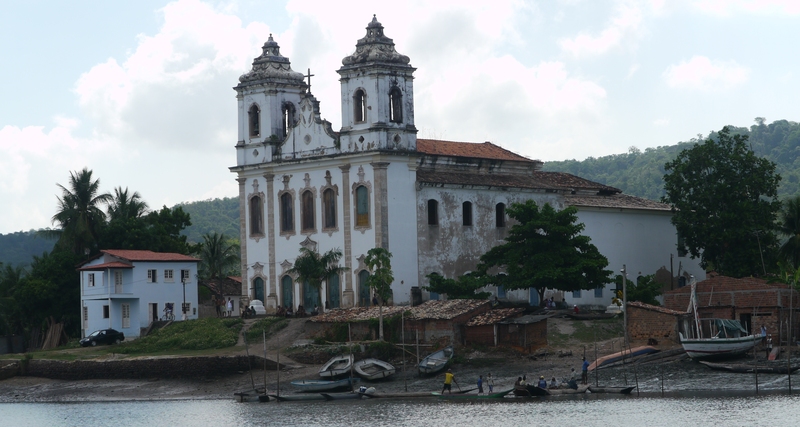 But the highlight was working our way right up the river, past the old, dilapidated but very picturesque Convento Santo Antônio built in 1692 (for a look around, anchor at 12°44.211S 038°52.519W), and round the bend to the equally picturesque and dilapidated São Francisco do Iguape. Most of the river is uncharted and extremely shallow apart from a narrow channel, and we nosed our way up without the benefit of the very helpful string of waypoints in Balette (pps 72 & 74). Nevertheless I would suggest you go up on a rising tide with your chart plotter (if you have one) pinging away at at least minutely intervals, and then follow the track back down. I would keep close in to the mangroves at Balette Wpt 11 – the shallow water goes quite close to the land here. When you get to São Francisco do Iguape you can anchor either on the near side or the far side of the river. We anchored at 12°41.042S 038°51.7W. I’m not convinced about the holding, particularly given the strong ebb current, so put plenty of chain out. There is a charming, very simple, village behind the church. This is the real rural Brazil, miles from the beaten track. No swanky restaurants, but I’m told there is a Frenchman who lives in the village (on the left of the town square as you walk into it from the river) who will serve you a memorable meal if you can find him. Either on the way up or coming back, go to the north side of Ihla do Arromba (p 71 in Balette – 12°49.8S 38°50.13W). When we were there, there were some absolutely spectacular, brilliant crimson Scarlet Ibis nesting in the trees there. You can anchor in reasonably shallow water tucked in between the Ilha do Arromba and Ilha do Monte Cristo on the west side. 35 miles and a pleasant day sail SW of Salvador is Morro do São Paulo (Balette p77) at the tip of the entrance to the Arquipélago de Tinharé. Described by my daughter as “the Ibiza of Bahia” it is the party place for the smart set. The anchorage is off “Paradise Beach” in between Morro do São Paulo and Gamboa, just beyond the “yacht club” (which was well and truly closed when we were there) at 13°22.916S 038°55.607W. Don’t go any further south than this – there are some submerged rocks there. There is a constant succession of fast local ferries between the two villages that shoot by day and night with music blaring, so tuck yourself in as close as you dare to the beach to be out of their path (one yacht was T-boned by one of these craft causing considerable structural damage) and put on as many cockpit / deck lights as you can at night. So, whilst just off one of the prettiest beaches in the world with delightful shack bars, it’s not a quiet anchorage! To visit Morro do São Paulo, take the dinghy to the pontoon where all the ferry boats go and tie up there. You would be advised to accede to the request for some money by one of the marineros to look after the dinghy in your absence. On the beach near Gamboa are some pink clay cliffs, where you can smear yourself with gloop for a rejuvenating body mudpack. For a more quiet anchorage one can either anchor off Gamboa (Balette p79 – 13°23.756S 038°56.671W) or one can cross over and anchor behind the Ponta do Curral (which is also good in a N or NE wind when the Morro and Gamboa anchorages become rather choppy). But watch out for the shallow spit of sand off the point. Go just beyond Gamboa where there is a conspicuous low, long white building and then cross on a course of 330° TRUE (it takes a while getting used to the massive 23°W magnetic variation), but err on the WSW side of the line – the shallows are very close to the ENE of this line and the ebb flows quite strongly and could push you towards the spit. We anchored off the beach at 13°22.688S 038°57.493W. Whilst there is a bit of traffic there, it is a lot quieter (and very well protected) as an alternative anchorage. Also a great place for a barbecue. On the way up the river is a small village on the left called Galeão, a very simple place which has a boat yard on the beach, building and repairing traditional saveiros with not much more than an adze and a screwdriver. We anchored at 13°23.888S 039°02.2W. The passage upriver to Cairú (Balette p80) is straightforward (but try and go with the flood tide or it takes ages). We anchored off at 13°28.958S 039°02.62W and dinghied ashore. Some nice baroque architecture and a tour round the fascinating and beautiful Jesuit monastery built in 1650 is a must if you have the time for this diversion. Another good day-sail south (35M) is the Baía de Camamu. If you read Ceccon he talks about a complicated entrance, aided by a succession of buoys. When we arrived there, there was not a buoy to be seen. However the entrance was not as difficult as we had been given reason to believe, as Balette (p85) shows. Ceccon and/or Morgan might also confuse you about the location of the Campinho anchorage (Balette p87). Suffice to say you go just beyond the disused large concrete pier and the dilapidated but still used wooden ferry pier and anchor just off the village of the village – 13°54.853S 038°59.389W. A safe haven but to be honest we couldn’t find much of interest ashore. You can’t get to the local capital town of Camamu in your own boat as it is very shallow but you can (and should) visit it by ferry that left at 0600 (check) from the wooden jetty. THE day to go is Saturday when the Camamu market takes place. See my blog page: http://blog.mailasail.com/mina2/79 for a graphic description. About 12 miles upriver is Maraú (Balette p94) . We anchored off the town and went ashore in the dinghy. It was a Sunday and we found the small town completely deserted. Apart from a rather bizarre mural painted on a large round wall on the river front (photo – Balette p95) there was nothing at all to recommend the place. For us, it was a disappointing diversion. Had we had access to the information in Balette we would have gone further upriver to the Tremembé waterfall. On the way upriver we had recce’d some anchorages, very carefully circumnavigating Ilha Germana (Balette p93) and on the way back down we anchored for a couple of nights in between Ilha Tatus and Ilha dos Tubarões surrounded by tropical jungle. Totally secluded, it was a magical anchorage. A further 25 miles south brings one to Itacaré (Balette p98). It’s a dodgy entrance – don’t try it in anything other than settled weather, and then only after half flood – but it’s well worth the effort once you get in. The village is now quite touristy, particularly popular amongst young surfers, but it remains delightfully unspoilt. If you are lucky enough to see a fishing boat approaching, wait for it and follow it in. They will guide you over the bar through the narrow curving channel between the rocks and the sand bank and show you exactly where to anchor. If you’re on your own, disregard Morgan who suggests you turn to starboard to anchor – I think the sands must have shifted since he published – but follow Ceccon or Balette and turn to port and anchor exactly at 14°16.520S 038°59.583W. There is a pool just big enough to allow swinging room. Heaven knows what you do if there is another yacht there! At low water, your boat sits picturesquely in this pool with the Atlantic surf crashing onto the beach just the other side of the bar. If you can, try and time your dinghy excursions ashore either side of high water or you will be dragging the dinghy over large expanses of muddy sand to get into the channel and back to your boat. If I had had Balette at the time, we would definitely explored the Rio das Contas by dinghy, which looks wonderful. Again, on exit, wait until you have at least 1m of water according to the Camamu tide table (no earlier than half tide) – we went aground just before half tide for a while and it is very hard unforgiving sand. Another 30 miles south lies Ilhéus (Balette p102). We anchored just off the yacht club at 14°46.8S 039°01.965W. The thatched yacht club here is absolutely charming and they were very welcoming and helpful. Excellent caipirinhas, good food and you can make use of the swimming pool as well. The town is a pleasant but good 15 minutes walk along the seafront. Interesting church and some good restaurants. From Ilhéus, the distance between safe havens increases and out next stop was Ilhas Abrolhos (Balette p112) about 185M south. This small group of islands lies 35M ESE of Caravelas. The islands are a National Park and famed for the diving over coral and the exotic tropical fish that feed on them. Because of the coral you have to pick up one of the mooring buoys. Landing on the main island of Santa Bárbara is not allowed without a permit, available only in Salvador. Without that permit you can only land on Ilha Siriba, and then only escorted by a park warden. Permit or not, there is a charge for visiting yachts. We had been told the charge was R$6 per person, Balette says R$8, but the warden told us that it had now gone up to a staggering R$50 per person – a little under £20 a head. As this charge had only just been introduced, the warden hadn’t got any tickets yet, so we were “encouraged” to buy an Abrolhos T-shirt each for R$30! As there was quite a swell in the anchorage on the north side of Santa Bárbara, we picked up one of the 4 visitors buoys in the southern anchorage at 17°57.886S 038° 41.900W. Unlike the lush tropical jungle along the rest of the coast, the islands are completely barren except for a bit of scrubby grass and a handful of palm trees planted there years ago to provide food and water for shipwrecked mariners. So the only interest here in the summer is under water, and the nesting Brown Booby’s, Frigate birds and Red-billed Tropic birds. The snorkelling is wonderful. But the time to really come here is July to November when Humpback whales come from Antarctica to breed and give birth to their young. Apparently the water is like whale soup. There is a regulation that boats are not allowed closer than 50m to a whale but apparently, in practice, it is impossible to be more than 50m away – they are everywhere. Something to look forward to on our way back north, I hope. Our next planned destination was Guarapari – it was not to happen. A cold front come through with strong southerly winds and big seas, and we turned tale to seek shelter in Caravelas (Balette p110) 70 miles north. So long as one avoids the well charted reefs that are strung out about 5 miles off the coast off the entrance, the approach to Caravelas is well dredged, well buoyed and straightforward (but if you are coming in after dark, don’t rely on all the buoys’ lights working). There are also red and white lit leading marks at the end of the channel. Morgan and Ceccon encourage one to anchor off or near the Iate Clube. Don’t bother – it’s a long walk into town. Much better to continue to the town jetty on the starboard side and anchor just to the east of it in 3-4m (17°44.682S 039°15.404W). You will have plenty of room so put out lots of scope as the ebb tide at springs is vicious. You can refuel at the town quay but you have to walk into town to the fuel station to arrange for the pump man to come down to the quay. Caravelas is a simple small town with great charm but few facilities. For a chilled day out on a lovely beach with good simple restaurants, take the bus 10 miles north to Praia de la Grauça. Or the bus to the fishing and market town of Alcobaça 20 miles to the north. The next stop was 170M south at Vitória (Balette p 117) in the Baía do Espírito Santo, where one avoids the enormous oil terminal at Tubarão and heads for the Vitória Iate Clube and anchors off (20°17.882S 040°17.197W). Vitória came as an enormous surprise. The only city we had been to in Brazil was Salvador which is pretty rough and ready. All the other places we had been to were completely impoverished small towns or villages. Imagine our surprise to sail into Vitória to find a very modern, clean, wealthy, vibrant city, full of high class shops and restaurants. What a contrast – and a very pleasant one. The Iate Clube (yacht club) was very welcoming and for a nominal R$ 5 (about £2) per head per day we had full access to the upmarket club facilities including excellent bar and restaurant overlooking the harbour, swimming pool, sauna etc etc. South of Vitória are some oil fields some way offshore. We were advised to go inshore of them as there is lots of sonar exploration to seaward towing very long sonar cables. At 22°S, off the Cabo de São Tomé, lies a shallow bank and the advice is to keep a full 25 miles offshore in any weather as the seas can break over the bank. Also along this stretch are many dozens of fishing boats, both drifting and trawling at night. You can never rely on a Brazilian fishing boat to have the correct lights and most of those drifting with long nets (allegedly up to two miles long) carry no lights at all so as to avoid attracting flying fish. Theoretically they have radar and will see you, but best to shine a light on your sails periodically. If/when they spot you they will shine a strong light in the direction of their nets. If they give you two flashes and then turn their searchlight off , that is the signal that you will be clear of their nets. The run of comparative sophistication continued. Búzios (Balette p 127), 185M south of Vitória with a dog leg round Cabo de São Tomé, is not far from Rio and is the St. Tropez of the coast. Once a small fishing village, it was made popular by Brigitte Bardot with whom the village remains obsessed, and it has remained THE fashionable resort since then. Strict planning has meant that the old village charm has been (almost) maintained. We picked up a mooring of the Iate Clube Armação de Búzios (a member came out to help us) at 22°44.856S 041°53.017W. The club is very welcoming and has a novel policy about visiting yachts using their moorings and facilities. Unusually, no charge is made, on condition that you spend at least R$25 (£10) per day per head in the restaurant and bar. As the food (breakfast, lunch and dinner) was excellent, and the caipirinhas large and potent, this didn’t represent any great problem. To split the journey to Rio de Janeiro, we stopped off at the anchorage at Praia do Farol for the night, (Balette p138) which we accessed through the gash in the rocks on the SW of the peninsula between Ilha do Cabo Frio and the mainland, to avoid having to go over the shallows in the bay. When we were there it was blowing old boots so we anchored well off the beach at 22°59.914S 042°00.486W. It is supposed to be a beautiful, totally protected anchorage. It wasn’t when we were there as an enormous storm erupted. See my blog, 14 March, entitled “The Anchorage From Hell” for details! A 70-mile motor brought us to the realisation of the dream of sailing Mina2 into the Baía de Guanabara – the harbour of Rio de Janeiro (Balette p 140). It is without doubt one of the outstanding moments in a sailor’s life, sailing past the Sugarloaf Mountain and the Cristo Redentor, amidst dramatic, verdant hills. Everyone says that the facilities of the marinas at Niterói on the east side of the bay are excellent, but it is on the opposite side of the bay to Rio itself and therefore not convenient for us as we have a number of friends who live in Rio who we wanted to entertain. So we went to Marina da Glória (22°55.164S 043°10.192W), the only marina on the Rio side and not far from the city centre. It is the worst marina we have been to, ever. Bows to rickety pontoons, the smell of sewage was overpowering. It was even too much for half of the numerous rats which were floating, rotting and bloated, round the boat, the other half being very much alive and all over the rocks eyeing up the most convenient access to the boat. The marina staff were surly and uncooperative, and the facilities very limited, eg no bar and only one, extremely expensive, restaurant. And it was incredibly expensive. They only accepted Maestro cards (which we didn’t have) and they have no WiFi. But the management is changing so there may be hope. The area outside the marina is not safe, particularly at night, so you have to get a taxi whenever you go out. Much, much better are the facilities of the Iate Clube de Rio de Janeiro, which is a cross between the Royal Yacht Squadron and the Hurlingham Club. But they only allow access to members of clubs with reciprocal membership of which there are very few and not one British Club (although RTYC think they have reciprocal membership according to their website, they are not on the list!). However, they would welcome you if you are introduced by a member. They give you the first 3 days free and after that it is a fraction of the price of the Marina da Glória – so pull whatever strings you can to find a member and get in that way! Anyone can refuel at the Iate Clube and it was about the cheapest fuel we found at R$2.14 per litre (compared with a staggering R$2.52 at Bracuhy). For a relaxing day out there is a lovely beach and anchorage about 6 miles ESE of the entrance to Rio harbour at Itaipu (22°58.33S 043°02.85W). Whilst dropping your anchor you will probably be visited by Bruno in his canoe. A delightful entrepreneur, he runs the bar/restaurant “Pli Onboard”. He will bring you a laminated menu and deliver delicious dishes (and anything else you might want) direct to your boat. The Baía Ilha Grande (Balette p 161) , 60-odd miles west of Rio, is probably the best cruising ground in the whole of Brazil. 60 miles by 20 miles it allegedly has 365 islands – one for each day of the year – and you could cruise here for months never visiting the same place twice. We had limited time here, before we had to put the boat to bed for the winter, but our first anchorage – and arguably the best – was in the totally protected Saco de Ceu (Balette p 165). There are plenty of corners to anchor in, but we chose 23°06.37S 044°12.16W. Absolutely beautiful and rather reminiscent of Greece. There are one or two lovely restaurants round the small bay. For all the bureacratic documentation, supermarkets and the only place in the bay with any variety of shops etc is Angra Dos Reis (Balette p 168). We anchored just outside the Marina Piratas at the top of the bay, but we were subsequently advised that this is not a safe thing to do – several boats have been broken into whilst the crew were ashore. Better to go into the marina where I think you would be able to tie up alongside on the starboard (seaward) side for a few hours (the other marinas in the vicinity are private clubs and don’t welcome visitors). You can also refuel at the Marina Piratas. There is a large supermarket within the marina which is incredibly handy, together with cash machines, shops and restaurants. It is about 20 minutes walk into town, or you can get a bus or taxi. Praia do Dentista – Ilha da Gipóia. 23°03.923S 044°21.316W. Very pretty with lovely beach. But this is where the film stars (and everyone else) come in their motor boats, so from mid-morning it gets unbelievable crowded (more than 100 boats when we left). Most boats anchor and put a line ashore. South side of Ilha da Gipóia. 23°02.772S 044°22.334W. Even prettier than Praia do Dentista, but can’t really get in close enough. Also quite a swell so not that good apart from a windless day – so 5/10. Saco do Tanguazinho. 23°00.642S 044°21.635W. Nice little anchorage with swinging room and depth for one boat only, but quite enclosed and therefore mosquitoes?, so 5/10 (there is an anchorage the other side of the peninsula in Saco do Tangua, but it is rather spoilt by a large resort). Researching laying up opportunities, we discovered that about the only place in the area was Marina Verolme (Balette p 174) that has travel-hoists and, apparently, every repair and maintenance service you could wish for. Only problem was to have the boat lifted, stored ashore for six months and relaunched was going to cost three times the price in Europe. So we have left the boat in the water in Marina Porto Bracuhy (Balette p 177) 22°56.952S 044°23.766W. It is a wonderfully protected very pretty marina with good security. They will encourage you to go stern to on your anchor, but for any length of time in your absence, insist on attaching to a buoy (which might take a bit of time and cost in arranging). The downside is that whilst they have nice restaurants on site and clean loos, those are the extent of the facilities there (the boatyard mentioned in Balette has now closed with no plans to re-open). No WiFi, no cash machines, no shops. There is a laundry service available very near the marina and a small food and general stores shop 5-minutes walk away in the village of Bracuhy, but for eveything else there is an infrequent 40 minute bus ride into Angra Dos Reis. There is a fuel pontoon at the entrance to the marina, but selling the most expensive diesel anywhere – probably much cheaper at Marina Piratas in Angra. There are a number of liveabords in the marina who are all very friendly and helpful and will introduce you to people who will clean the bottom of the boat periodically (the water is like a petri dish here – incredibly high fouling – I arranged to have black plastic bags put round the prop and bow thruster). You will also want to arrange for someone to come in every week or so, air the boat and brush the cushions unless you want to come back to mushrooms! There may be other places for laying up in Paraty, or further south but I haven’t got there yet! Remarkable items in this article. Now i am extremely contented to look your current write-up. Cheers a whole lot exactly what looking forward to get in touch with an individual. Can you please decrease us a e-mail? one else realize such unique about my trouble.